manufacturing is expected to shrink by 17 per cent this decade, wiping out 170,000 jobs. Keen explains this and more in his regular free seminars in South East Queensland and in his online webinars. “With my new DIY concept business owners can save $10,000s on normal franchise set up costs and the timing is right for small business to take the lead in job growth. Micro- franchises with 3-10 outlets can be very successful and self-financing,” says Keen, who passionately believes they are ideally suited for regional expansion. 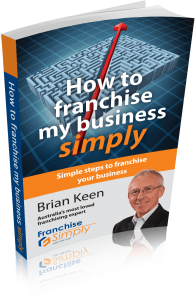 Keen has a long and successful relationship with franchising. As well as associations with franchises Ultra-tune, Donut King and Brumby’s, Keen helped establish many new franchises, including the simple and successful Jim’s Mowing. He also established six of his own franchise groups that grew to 120 outlets over a five year period. Keen also explained that the 2011 BRW report showed franchisor revenue (which is of course a function of franchisee revenue in most systems) growing by 12 percent and profitability by 19 percent. And the outlook is optimistic, with franchise systems forecasting a growth of 13 percent for 2011, and 49 percent over the next three years – and growth is expected to continue at a healthy rate. ‘With the Australian economy jumping somersaults over many other economies in the developed world, the scene is set for franchising to continue its strong run in 2011 and onward,’ he said. Keen is presenting free seminars at 6pm on Monday 11th July at Fitzy’s Loganholme, Tuesday 12th at Travelodge Garden City and Wednesday 13th July at Nerang RSL. Seats are limited so booking is essential.